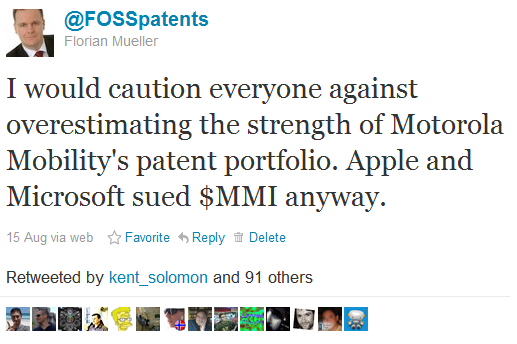 I reiterated this in my first blog post on the subject and a more elaborate follow-up, in which I clarified why my position is that Apple attacked Motorola even though Motorola technically won the race to the courthouse. 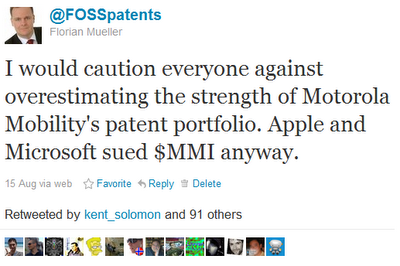 I have meanwhile seen articles in which certain experts -- who are experts in some areas, but likely spend less time perusing Android patent suit court filings than I do -- claimed that Motorola was the aggressor and Apple "forced to defend itself", which is plain wrong. 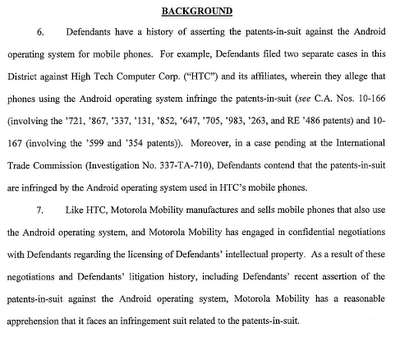 On that page 6, you can see that Motorola brought infringement claims against Apple on October 6, 2010 (an ITC complaint, two federal lawsuits in Delaware and another federal lawsuit in Southern Florida). At first sight, it does look like Motorola drew first blood. But on the next page (page 7), you can see that only two days later (October 8, 2010), Motorola filed yet another lawsuit in Delaware and that was a declaratory infringement action against 12 Apple patents. A declaratory judgment ("DJ") action comes down to a party suing itself over someone else's patents, as a pre-emptive strike. The primary motivation to do that is usually to maximize the likelihood of litigation taking place in one particular court as opposed to another. Companies do this frequently to avoid such venues as East Texas. One of the more recent examples is Wolfram Alpha's DJ action against Lodsys. If you sue first in your preferred district, the first-filer status greatly increases the likelihood of all future litigation between you and that company being transferred to the place of your choice. It doesn't guarantee it, but it works most of the time. Since this is about first-filer status, it's exactly the kind of measure someone takes to win the race to the courthouse. If you go back to the slideshow and click forward by two more pages, you get to October 29, 2010, and can see that Apple -- although Motorola was already "suing itself" over 12 Apple patents -- asserted six more in Wisconsin and three of them in an ITC complaint. That was still reasonably close to Motorola's lawsuit, but it's not an indication for when Apple was going to file a lawsuit. It's highly probable that Apple had a lawsuit in the making but had to change plans after the DJ action in terms of which patents to assert in which court. It's possible that the DJ action pre-empted Apple by only a day or two, but even a few weeks doesn't mean much. The key thing is Motorola's "reasonable apprehension" of an impending action by Apple. To sum this up: Motorola filed infringement actions against Apple on October 6, followed by a DJ action on October 8, and Apple brought an infringement action on October 29. By early December (see the first page of the document) they were suing each other over 42 patents: 24 Apple patents, 18 Motorola patents (a number of which are weak tea due to FRAND encumbrances). 7. Like HTC, Motorola Mobility manufacures and sells mobile phones that also use the Android operating system, and Motorola Mobility has engaged in confidential negotiations with [Apple] regarding the licensing of [Apple's] intellectual property. 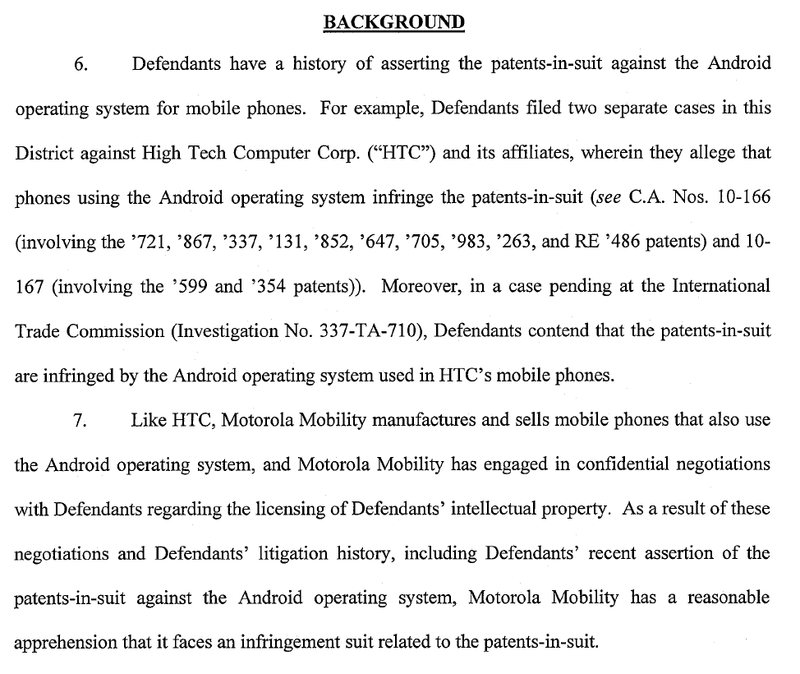 As a result of these negotiations and [Apple's] litigation history, including [Apple's] recent assertion of the patents-in-suit against the Android operating system, Motorola Mobility has a reasonable apprehension that it faces an infringement suit related to the patents-in-suit. Like I said, they had it coming and their first lawsuit was just a pre-emptive assertion of (relatively weak) counterclaims. Chronologically, they sued first. But strategically, Apple determined that it wouldn't have to worry about that portfolio -- and that's the same portfolio that Google claims will serve to protect Android from Apple, Microsoft (who undoubtedly sued Motorola first) and others. The protection story is a smokescreen. Motorola Mobility's portfolio has failed to deter, and it has so far failed to make any meaningful headway in litigation. Motorola Mobility is on the losing track against the very two companies Google says those patents will provide protection from. I have a reasonable apprehension that antitrust regulators won't subscribe to such an implausible pretext, and I can't imagine that those Android OEMs who welcomed the deal don't understand very well what's really going on. Obviously it doesn't make business sense for them to spell it out right away. But we might hear at some point that some of them file confidential complaints with competition authorities around the globe.